BY SHOPPING locally and supporting small businesses, you could be rewarded with prizes such as free cups of coffee, jewellery, movie gift cards and discounted meals. Shopping centres now reward loyal customers who walk through their doors rather than shopping online by offering a points system through smart phone apps. Redbank Plaza is digitally rewarding people through its Redbank Rewards app. Points are added through beacon technology to your account every time you enter the centre (as long as you have location services on your smart phone switched on), and every time you make a purchase and scan the QR code located inside the different businesses. These points can then be redeemed for prizes which you will find only on the app. Shoppers will also be able to see exclusive deals from retailers, as well as competitions, giving customers the opportunity to enter the draw to win larger prizes. This week, Cineplex Redbank Plaza launches its prize for app users - free $10 movie gift cards. 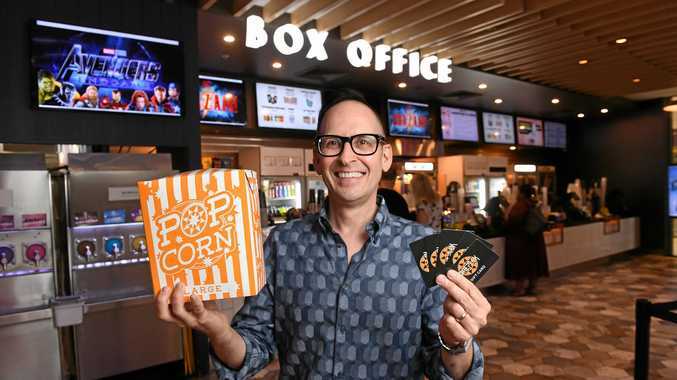 Cineplex Redbank Plaza operations manager Terry Halliwell said he was excited to give back to the community. "There has been a lot of demand from shoppers about us bringing back the movie gift cards, so we are happy to give them what they want," he said. "We sat back and had a look at the demographic of shoppers and found they were families who want big screen entertainment at family friendly prices. "We are excited to be part of the rewards program." Mr Halliwell praised the shopping centre and the app, saying it was a fantastic way to support small businesses. "It's a great way for those who come to the centre all the time to be rewarded for shopping locally," he said. You can download Redbank Rewards from the App Store.